When I was a kid, my mother loved to take pictures of me reading books. Curled up in the recliner on Christmas morning, reading a new book while still in my pajamas; stretched out on a towel on Wrightsville Beach; laying across the floor at Grandma Hamm’s house. All with a book in my hands. I didn’t realize just how many times she’d taken photos like this until I graduated from high school, and she gave me a present: A photo album that chronicled my life so far. All 18 years of it. And on almost every other page, I’d find these sorts of photos. My favorite, though, is one that my mother didn’t take. That’s because she’s in it. It’s from 1995. We were at my Uncle Gary and Aunt Deborah’s house, probably for Thanksgiving. I love it because of our matching smiles, dorky glasses, and the way we both have one hand placed on the big book open between us. Mostly I love it because it says so much. I couldn’t tell you what the book was, but I do remember the comfort, the safety, of being curled up next to my mom on a couch, reading a book. I’ve loved reading for as long as I can remember—even when I wasn’t technically reading, but as I listened to her as she read us The Berenstain Bears books, my brother Jay and I on either side of her. It started with the Berenstains. Later, we had Laura Ingalls, Nancy Drew, and Trixie Belden. And then: Margaret. Steph. Deenie. Sally J. Freedman. Karen. If you grew up in the 70s or 80s, you might have recognized many of those names. They’re all characters from Judy Blume books. By the time I became familiar with these girls, I’d outgrown the nighttime ritual of Mom sitting at the end of my loft bed, reading me Little House on the Prairie books or her old Trixie Belden’s. But it was because of my mom that I did get to know them. And when I say get to know them, I mean exactly that. Like so many other young girls, I devoured Judy Blume’s books—always finding something in each protagonist that I would identify with so deeply, so intensely, I’d think, How did she know? or, It’s not only me! Then, in high school, I snagged Mom’s paperback of Summer Sisters. I fell in love with it. I fell in love with Vix, the main character. I obsessed over Caitlyn, her “summer sister,” just like Vix did—and resented her, too. It felt real. I’ve read Summer Sisters almost every single summer since that first reading. I took it to Wrightsville Beach, the summer after Mom had died, when it was just Dad and me. I sat on the balcony of our hotel reading it, just like Mom had sat reading books so many different summers when we had visited, all as a family. Reading it was like taking a vacation from my heartbreak. I didn’t feel sad or angry or confused. Everything felt right again. I owe my mom and Judy Blume for that gift. From my mother, I have my love of reading, a lifelong comfort. When I want to talk to my mom sometimes so badly that my chest actually hurts, I can pick up a book and feel okay again—or at least not think about it anymore. And obviously, so many women have Judy to thank for writing the stories she has, for sharing these characters that so many of us can find ourselves in, even if it’s in a small way. Last night, I had the absolute thrill of meeting Judy Blume. She finally made a movie out of one of her books, Tiger Eyes. Out of all of her books, she had to make a movie out of the one I never read! 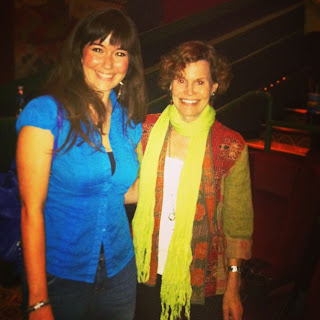 The movie played at a theater nearby last night, and Judy Blume was there for a Q&A session following the screening. She was wonderful. She was down to earth, kind, and full of joy. She choked up talking about how meaningful this story was to her. She talked about her son, Larry, who directed the movie, with such love in her voice. When the Q&A was over, even though she had made a comment about how exhausted she was from all of her traveling and weekend’s events, she still stayed and talked to the people (mostly women), who were lined up waiting to meet her. My favorite was the woman, probably my age or younger, who was standing behind me, clutching a beat up paperback of Starring Sally J. Freedman as Herself. She’d had her mother FedEx it to her so she could have Judy sign it. As for me, I stood clutching Mom’s now very worn paperback of Summer Sisters. I nervously handed it to one of my lifelong heroes and asked her if she would sign it, telling her it had been my mother’s. No one but me knew that at that moment, I felt as content as I did sitting on a hotel balcony reading my mother’s old paperback. No one but me knew that for just that quick moment, meeting Judy Blume, I felt like I could almost hear my mom laugh again. Almost. And it was enough, almost. I think of Davey, the protagonist of Tiger Eyes, so distraught over the death of her dad, but yet still so strong. At the end of the movie, she dives in the ocean and swims. You know she’s going to be okay. Thanks to a little help from Judy Blume, so many of us know the same. Hopefully you have submitted this to the #JudyBlumeProject ladies. Such a heartwarming story to read about one of our film screenings. Judy is hard at work with her new book and we know that posts like these keep her going through the difficult task of writing. Thanks for sharing it. For anyone wishing to see Tiger Eyes, it is now available in the US & Canada on digital streaming sites like iTunes, Amazon Instant and Youtube Movies. Tears! I have tears! Thank you so much to the @TigerEyesMovie staff for pointing out this beautiful post on the #JudyBlumeProject thread on Twitter! It absolutely should be a part of the #JudyBlumeProject. We'd be honored if you'd apply our badge to this post (it is available at http://thekitchwitch.com/ scroll down--you know how Judy is against censorship? Don't let the swear jar get to you, it's a back-to-school doozy today, but as always hilarious! ), and then we'd be thrilled to link it to our Facebook page (https://www.facebook.com/pages/The-Judy-Blume-Project/448595131881886), where you can read the other posts to date, and via the Twitter feed. Great one today! After a rather quiet summer, I have a very exciting back-to-school series (guest post by author, Jim Denney) in four parts coming out later today to get the ball rolling on the project again! Thanks so much for reading and sharing this! I will add the project badge to the post. We're delighted to, Alison! Thank YOU! How Much Was Mine to Keep?